Israeli warplanes attack Hamas targets in Rafah. Rockets fired at Ashkelon intercepted by Iron Dome. 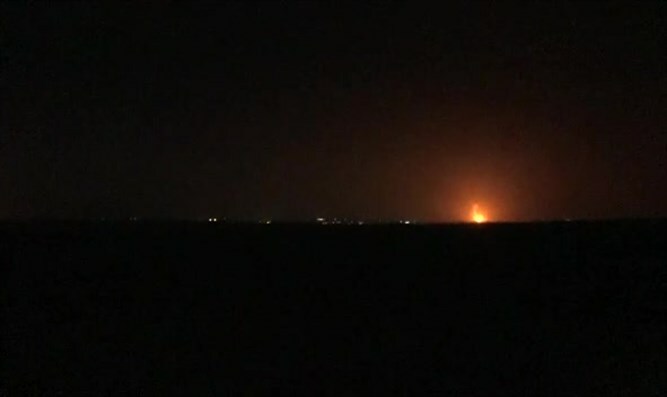 The IDF Spokesperson's Unit announced on Tuesday night that Israeli warplanes and aircraft attacked a number of terrorist targets at a military compound belonging to the Hamas terrorist organization in Rafah in the southern Gaza Strip. The attack was carried out in retaliation for the launching of a rocket from the Gaza Strip into Israeli territory, the firing of explosive balloons and the torching of the camouflaged netting of a military post on Tuesday. “The IDF is determined to carry out the task of protecting the citizens of Israel and is prepared for various scenarios and to intensify its activities as necessary,” said the IDF Spokesperson’s statement. After the airstrike, just before 4:00 a.m., a siren sounded in the Ashkelon industrial zone. The IDF Spokesperson's Unit said that one rocket was identified as having been launched from the Gaza Strip into Israeli territory and had been intercepted by the Iron Dome. Earlier on Tuesday evening, IDF warplanes attacked a number of terrorist targets in the southern Gaza Strip, including a military compound and a weapons manufacturing site belonging to the Hamas terrorist organization in Khan Yunis. After the Israeli airstrike, sirens were sounded in the Ashkelon industrial zone. The IDF said one rocket was launched toward the area and intercepted by the Iron Dome anti-missile system. According to the IDF, "Following reports of a siren in the Eshkol Regional Council, one launch was identified from the Gaza Strip into Israeli territory." The siren was sounded only 15 minutes after the IDF issued an official announcement of a return to a normal routine and the lifting of all restrictions imposed on the residents of the Gaza envelope and Netivot, Ofakim, Ashkelon, Merhavim, Hof Ashkelon and Bnei Shimon.